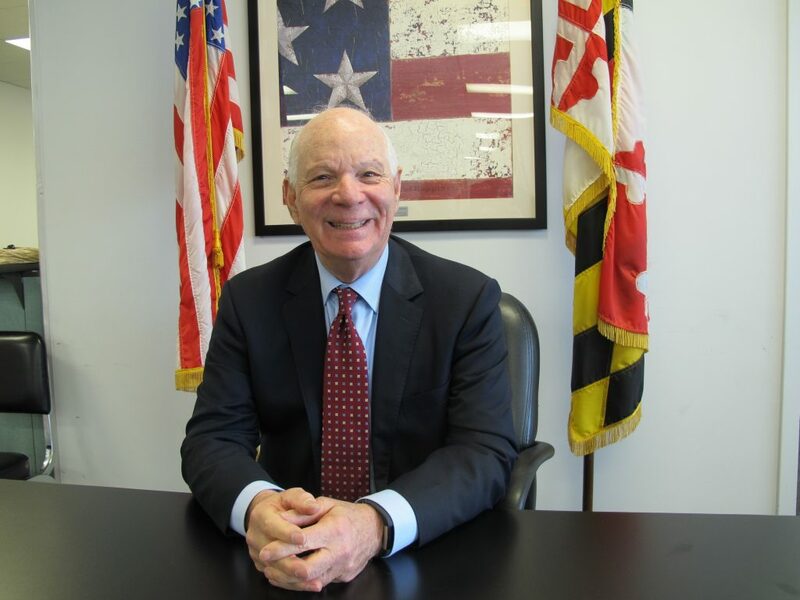 A public servant for more than 50 years, Sen. Ben Cardin from Maryland has devoted his life to the people of his state and his country. While still at the University of Maryland School of Law in 1967, he began his career in the Maryland House of Delegates, where he served for 20 years. He then served in the U.S. House of Representatives from 1987-2006, and in the U.S. Senate since 2006. 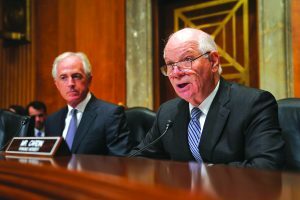 A proud Democrat, Sen. Cardin emphasizes the ethics that guide his policy making. He is a senior member of the U.S. Senate Foreign Relations Committee, serves on the Senate Finance Committee, and is a Ranking Member of the Small Business & Entrepreneurship Committee. A staunch supporter of Israel, Sen. Cardin recently co-authored the Israel Anti-Boycott Act, which seeks to curtail BDS activity against Israel. While critical of President Trump’s pullout from the Iran deal, he is remembered for having broken ranks with Democrats when he voted against the deal in 2015. In an exclusive interview with Hamodia, Sen. Cardin speaks about his views and his work on behalf of the American people. Three years ago, you bucked party lines and voted against the Joint Comprehensive Plan of Action, resisting pressure from President Obama and fellow Democrats. Do you feel validated by President Trump’s decision to quit the Iran nuclear deal? No. I think it was a bad agreement. I’ve always felt that way. The main problem was not whether Iran was complying or not, because they were complying. The fundamental problem was that the time periods made it too easy for Iran, under cover, to develop a nuclear weapon. And we may not have been able to discover it in time to take effective military action against it. The second problem was to ignore their support of terrorism, their human rights violations, and their ballistic missiles, which were specifically left out of this agreement. There had to be a follow up plan. Then why do you oppose President Trump’s decision to withdraw from the Iran deal now? Because President Trump’s decision to withdraw the U.S. from the deal is bad policy. Pulling out calls into question America’s international credibility. President Trump has breathed air into Tehran’s inevitable argument to the international community: We kept our end of the deal, but America is not good for its word and cannot be trusted. It is, in fact, America that has now violated its obligations under the deal. That emboldens Iran and endangers Israel. And this is before President Trump is expected to sit down with North Korean dictator Kim Jong Un. Also, with the U.S. pulling out, there’s no way to get universal sanctions against Iran, unless Iran decides go back to its nuclear program. Iran will be able to continue to enjoy European relations. So this is going to be more symbolic. What would you have proposed to do? Last year, Congress passed into law a number of sanctions and other tools that President Trump could use to hold accountable three of America’s principle adversaries: Russia, North Korea and Iran. I was proud to co-author and negotiate that legislation through to final passage. President Trump has not used the full power of his office, or the additional tools Congress granted him, to strengthen our hand and lead the international community against Iran. It did not have to end up this way. With all the fanfare surrounding the Jerusalem embassy move, you came in for a few boos during a recent Jerusalem Post Conference interview, when you seemed to attribute the move to Congress rather than to President Trump. Do you think that politics should be avoided when it comes to support for Israel? Congress, which is the policy arm of our government, declared a long time ago that Israel has a right to determine its capital, and it’s Jerusalem. We did that decades ago. The president carries out our policies. But moving the embassy is a strategic decision. It’s one which previous administrations, in consultation with the government of Israel and our allies in the region, made decisions not to implement. You can argue whether that was right or wrong. President Trump decided that it’s time to do it. I don’t disagree [with the decision]. By not giving President Trump credit, it seemed as if you were putting politics over policy. You’re absolutely right about that, but that’s not what it was. That’s one of the problems we have with partisan politics today as it relates to Israel. You have to be careful of everything you say, because someone is going to interpret it politically. I did not mean that at all as a political comment. I meant it as a statement of fact, that Congress had already made that decision. This was a strategic decision made by the Trump administration. But there are pros and cons in the manner that he handled it. He did it; he pulled the band-aid off. Did he do it in a way that maximized U.S. leverage? No. Did he move the peace process forward? No. Could he have used it in that way? Well, we don’t know, but I can tell you this — the day before and the day after he made the decision, I talked to King Abdullah of Jordan. And the day before, King Abdullah was of the impression that this could have been used as a way of moving things forward. But don’t facts on the ground suggest that some things, specifically the peace process, cannot be moved forward? There’s no peace partner; look at Abbas’ most recent statement on the Holocaust. I think that’s true. It was one of the most offensive statements I’ve ever seen. That was horrible. But you’re right, the peace process is not going to move toward a constructive end at this particular moment. I agree that there’s no partner. But we do have partners in the Middle East. Talk to them. There are things beyond the peace process in which the Israeli government can help facilitate more peaceful relations in the region. Would you agree that more peaceful relations are already developing between Israel, America and the Sunni States? Things are moving along. The major focus of the Sunni states is Iran. 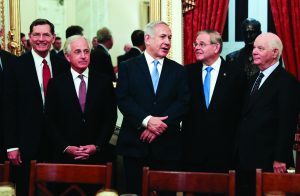 They’re interested in better relations with Israel. They are not going to fall on their sword as it relates to Jerusalem, the capital of Israel. So, by doing a little smart talking with those countries and Prime Minister Netanyahu, there could have been leverage. What leverage would you have liked to see? I don’t have the same tools [President Trump] has at his disposal from his intelligence community and from the State Department to know what is on the list of doables. But it would also have been a PR plus for the whole decision making [process]. I will admit to you, I would not use the strategies the president uses, but the president is achieving certain things by his strategies. I would argue he’s also created significant damage to the U.S. because of his strategies, particularly on our values, which are our strength, what we stand for as a nation. We do believe that people should tell the truth, that there are certain standards that everybody has to comply with. That includes potential conflicts. You don’t even have to have a conflict; to have a potential conflict is enough. Do you think other presidents were conflict-free? Check my history — I have criticized Democrats, Republicans, prime ministers of democratic countries, dictators and despots. I have pretty high standards. I was right over the United States over torture, right over President Obama on the way he handled Gitmo Bay. Some of Obama’s decisions that he made over privacy were outrageous. And I’ve said that. I was very strongly outspoken on Clinton’s moral lapses. He put the presidency at risk. It’s outrageous. The Democrat party’s shift to the left is reflected in its support for Bernie Sanders, Keith Ellison, Black Lives Matter, CAIR and its past election platform, which was weak on Israel. Are you concerned about the direction the party is headed in? Recognize that we’ve always had partisans that will use issues to try to influence partisan results. But a really partisan division would be support for Israel, and so far we have not seen any such tangible division play out in the political system. A recent Pew report has pointed to that — the growing divide between Republicans and Democrats on support for Israel. Currently, 79 percent of Republicans say they sympathize more with Israel than the Palestinians, compared with just 27 percent of Democrats. I’m not disagreeing, but it hasn’t affected the political system yet. Appropriations for Israel is one of the easiest things in the foreign aid budget to get done. It drives the foreign aid budget. The BDS bill we’ve been able to pass with a unanimous vote — we have the support for it. The Taylor Force Act —we’ve been able to get that done. What about the future of the Democratic Party? So far, a leftward shift hasn’t affected us. It’s something we have to be very attentive to. I’m not suggesting that we don’t have a problem today that we have to attend to. I think we do. But I don’t think Americans will change their strong support for the America-Israel relationship, once the importance of that fundamental support for Israel is explained to them. We are two countries that share the same values. I think that if you do or don’t like someone, then it becomes partisan, and that leads over to the polling you’re talking about. There’s mixed support for Benjamin Netanyahu and there’s mixed support for Donald Trump. That doesn’t mean that we don’t love America; that doesn’t mean we don’t love Israel. We’re so sensitive that if the left wing doesn’t like the way the Palestinians are living today, they translate that to Israel, which is not fair. Do we have to educate more? Absolutely. They don’t understand the security risk to Israel, particularly at the Gaza border. Or take the Northern African migration issue — the left doesn’t understand that a large number of people came to Israel for economic reasons. These migrants didn’t come in the right way, and there were agreements reached as to how they would be resettled back in Africa. But the left isn’t aware of those issues. You need to explain it to them. All they see is 30,000 migrants, who happen to be of color, being treated very similarly to the way Donald Trump is treating people from predominantly black nations coming into the U.S. The left connects in a partisan way to this and gives you a reaction. I understand that. Our job is to educate. How do you educate if the media and college campuses, which are the main sources of education for most people, are left-wing and actually push anti-Israel policies? You’re absolutely right. The students are getting their information from a very narrow source. The right wing is getting their information from a very narrow source. We’re all getting news from a very narrow source today, and that’s frightening because our narrow sources are not as objective. I saw this with my BDS bill. I think the ACLU, a respectable group, was infiltrated by a very anti-Israel, pro-Palestinian agenda. Unfortunately, the people who listen to the ACLU press are going to be susceptible to that, and it reinforces the message of the anti-Israel people. While the Democratic Party used to be the traditional home of Jewish voters, the Orthodox voted overwhelmingly for Trump in the last election. In a growing trend, the Orthodox identify more with Republicans on political, cultural and religious issues. Do you think the Democrats can still woo Orthodox voters back, or do you think the cultural clash is too large of a divide for the Orthodox to ever return? That’s an excellent question. Times change. Will we ever have a time where 90 percent of the Jewish community belong to the Democratic Party, which was probably true 50 or 75 years ago? We’re not going back to those days. We are a much more heterogeneous political community. We integrated into American politics where we no longer feel threatened from one point of view in our political thoughts. I agree with you. When you look at the Orthodox community, they see a lot of which they agree with on the policy differences between the Democrats and Republicans. That is bringing them over to the Republican side. I also think very few people are one-issue voters. What you see happening in the Jewish community, you see happening throughout America. People are starting to be more discerning about who they vote for and not just for the party they happen to belong to. So I would think each presidential election will see a different makeup, depending on who the nominee is. For local elections it is more challenging. Last week, on World Press Freedom Day, you tweeted about the importance of a “free and open press.” With a blatant left-wing bias among the mainstream media, would you agree that the press is not so “free and open” today? When it’s the press today, it’s probably a more difficult question. I grew up when investigative reporting was something that was cherished in our society. When I was in the state legislature I had five or six reporters covering me regularly. When I went to Congress I had reporters covering everything I did. Today there’s one reporter that the Baltimore Sun has in Washington covering all the federal government, including the Senate and the House, with maybe someone else in the White House. So I’ve seen the total erosion of the capacity of independent investigative reporting, which I think is a real serious problem for America and our democratic system. Put on top of that, we’ve got the 24/7 news cycle where anybody can become a reporter or a blogger. It’s really challenging. I am very critical of information that is presented as news, whether it’s from The New York Times or a blogger. Everybody has a bias. That’s why you have to have a really free press and have different views out there. The first thing a dictator is going to do is control the press and even restrict what’s coming in the internet. You belong to Baltimore’s Beth Tfiloh Congregation, a modern Orthodox synagogue. How does religion play a role in your politics? I grew up in a very safe, close-knit Jewish community. I was 7 or 8 years old before I realized the whole world wasn’t Jewish. My mother was observant; my father was not. My family belongs to Beth Tefiloh now for 80-90 years. We keep kosher at home, but I’m not observant out. We observe all the holidays. Friday nights are sacred. I’ve been able to hold Friday nights without going out pretty rigorously. We have Shabbat dinners for 25-30 people in our family every Friday night. I get invited out a lot for Shabbat dinners but I don’t go out. This has been a part of my life, part of my values. We had very high ethical standards. I think America’s strength is its values. With your fight against BDS and your vote against the Iran deal, do you ever feel like you are identified as the “Jewish Cardin”? People do that and it’s wrong. You can’t filter who you are. Your values are your values. But I really guard my religion very carefully from my government work. Once, one of my closest friends gave me a mezuzah for my office when I was elected to the Senate. I feel very strongly that it’s a government office, so I decided instead to frame it and put it on the wall as artwork. I’m a meshugenah about some of these things. I’m very careful about church-state issues. I really believe America is one of the most faith-based countries because of religious separation. So you can’t separate who you are, but I very carefully guard against doing things because of my religion. But clearly people identify me with that.